Charles Moore examines at a young patient at the HEALing Community Center. Charles Moore never expected to be a hero to the medically underserved. His specialty is complex head and neck surgery for meningiomas, neuroblastomas, and other brain tumors at the front of the skull and reconstructive surgery to repair trauma to facial bones and tissue. But as a young Emory medical professor and surgeon, he met patients at Grady Memorial Hospital unlike any he saw while training at Harvard and the University of Michigan. Patients with enormous, bulbous tumors on their tongues and necks. Why hadn't they come earlier, when he could have saved them? He looked at their zip codes and found neighborhoods plagued by poverty, unemployment, lack of healthy food, and transportation. Somebody has to do something, he said. So, after long clinical days at Grady and Emory, he packed tongue depressors, gloves, and disposable dental mirrors in the back of his car and began offering free head and neck screenings. For many who lined up, he was their only source of medical attention. Moore's actions lit a fire. Residents, medical students, and fellow doctors donated time. A nonprofit organization provided a mobile unit. Governmental and philanthropic support grew that van into a clinic dedicated to helping challenged neighborhoods and the families living there get back on the road to independence. Then, in 2014, with more support from donors, the HEALing Community Center moved into its own 16,000-squarefoot building on Martin Luther King, Jr. Drive in Southwest Atlanta. 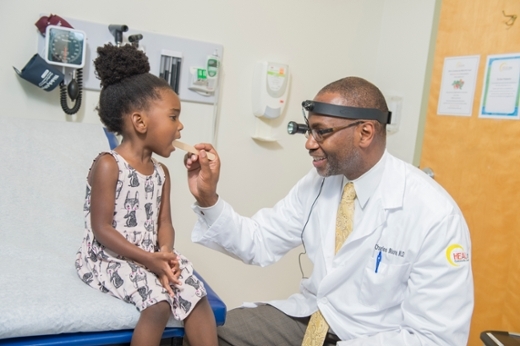 With a small core staff and dozens of physician volunteers from Emory, Morehouse School of Medicine, and Piedmont Hospital, HEAL now offers screenings, health education, and a wide range of medical, dental, and mental health services to more than 6,000 Atlantans annually. Fees slide between no cost to $20. A partnership with Emory's Urban Health Initiative (of which Moore is co-director) provides transportation, community gardens, and other needed programs. Without the center, many patients would have ended up in emergency rooms. Others don't know where they would have gone.